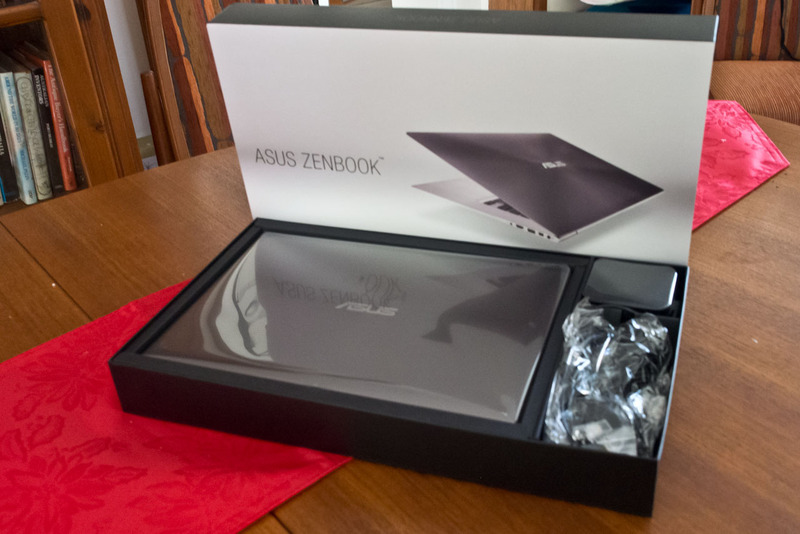 Welcome to my review of the Asus Zenbook UX303LN. This review covers the i7 version with 256 gb SSD, 8 gb of memory and FHD touch screen. Digital photography has two main elements, the first of course is capturing the image which of course is the foundation of what you are doing. The second skill is the processing of the image and that requires a computer with a decent screen. I changed from desktop machines to laptops quite a few years ago as I can take the laptop with me when I travel. My last laptop was a Toshiba P840 which was becoming quite frustrating to use. Crap keyboard and terrible screen. It worked OK if you plugged in a separate keyboard and external monitor but that defeated the versatility of being a laptop. What to buy? Well I took several months to decide, looking at all the compromises - do I go to a larger 15.6" screen (the old one was 14") or head down to 13" screen. I knew I wanted more resolution and an IPS screen. But with travel a key component, 13.3" screens seemed a good choice and a 1920 x 1080 FHD screen seemed to be the sweet spot. I also knew 8gb of memory would be fine and a SSD drive highly desirable to overcome slow start up times. Lighter was better, but I knew I could also use a separate graphics module to help speed up screen rendering of images (and also ensure all of that 8gb of memory was available for processing). There were several machines that quite interested me, especially those from Lenovo which also have fantastic keyboards and are usually fairly easy to upgrade. The problem was the cost after you optioned up the machines with the right amount of RAM, a decent processor and other bits. 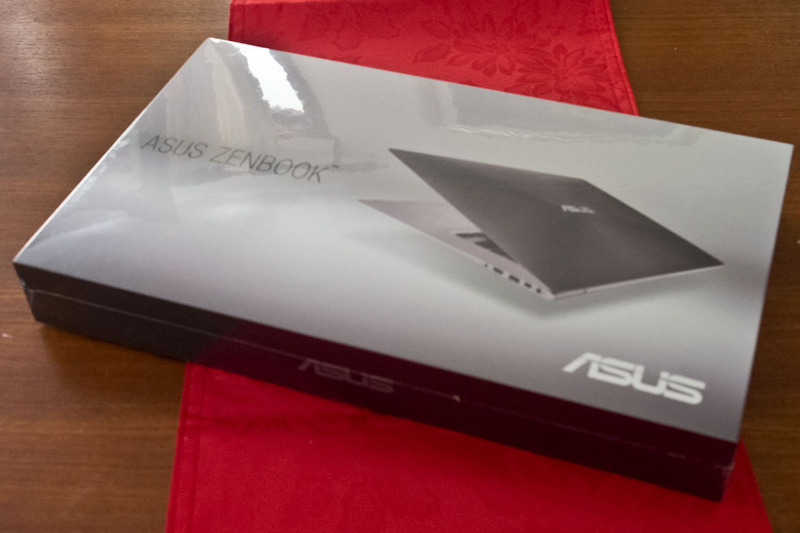 I started to see periodic sales of the ASUS UX303LN so checked it out. In the i7 version, it had enough RAM, a good screen and a 256gb SSD which was just adequate for purposes provided a lovely FHD screen into the bargain. I saw one for a good price from The Good Guys and ordered it to be delivered as the closet store was 200km away. Strangely, rather than assigning the order to closest store, it was assigned to one about 4000 km away. To say the service from the Good Guys was "good" would be far too generous. It was quite appalling and took 12 days for the computer to go from the back to the store to the front of the store for collection by the courier. The courier (StarTack Express) was stunning. Picking up the computer around 4:30 PM on the last Friday before Christmas and delivering it at 9:30 AM on the Monday morning. Not bad for a 3500 km air trip and then another 420 km by vehicle. The first thing that impresses is the packaging. While it comes in an ordinary looking cardboard outer box for shipping, inside is a glorious looking shrink wrapped box that looks so appealing. This looks something special. Next, peel off the shrink wrapping and raise the lid. Beautifully presented, neatly laid out and no wasted space. Take all the goodies out of the box and it still impresses. Take all the goodies out of the box and it still impresses. 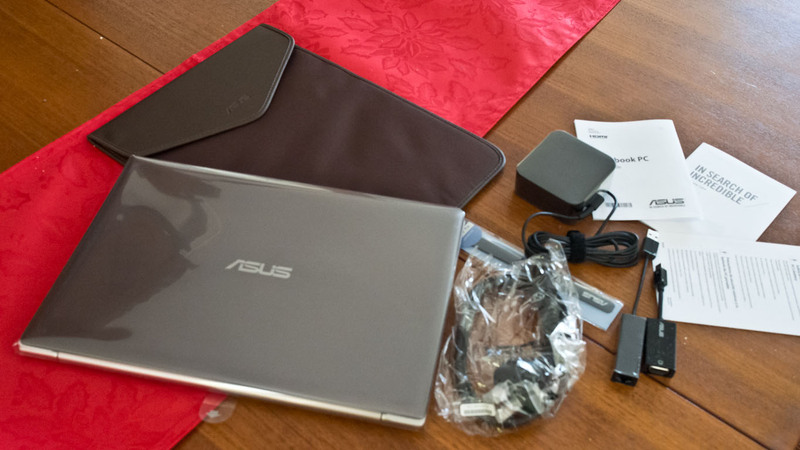 You get a brown fabric and fake leather computer sleeve, tiny power supply, dongles for USB to Ethernet adaptor and mini-DisplayPort to VGA and a cable strap (which is in addition to the ones on the cables). You also get the couple of sheets of paper (warranty, warnings and a pamphlet to get you going). Inspection of the machine reveals are pretty neat looking device in its aluminium/pseudo aluminium casing. The screen lid has a lovely brown-toned surface and the touch screen has gorilla glass or similar hard plastic that extends to the edges. No flimsy bezel to crack like an earlier ASUS laptop I have in the cupboard. The screen hinge seems quite good - the movement of the screen fairly light but enough to be stable when open. The base is made of a casting. It looks like aluminium but doesn't feel cold to touch. While it could be some sort of alloy, doesn't get really cold to touch. It is very rigid and looks great. The bottom appears to be a sheet of anodised aluminium. Plug her in, charge it up and away we go. First start up is the normal Windows 8.1 and fairly easy and nowhere near as annoying as it use to be. It all fits rather well although not quite like the hewn out of rock build of say a MacBook Pro - but pretty close. On the left you get two USB3 ports and a card reader. Cards stick out quite a way when inserted. On the right you get a mini-DisplayPort, single USB3, HDMI port and headphone/audio port. On this side is also the power input. The keyboard has quite nice keys. Not quite up to the standard of say a Lenovo keyboard but well spaced and with adequate travel. You can type at a moderate speed and be fairly accurate with this keyboard and it has variable backlighting which makes it great for working at night with minimal lighting. The only minor dislikes are the lack of dedicated keys for pgup, pgdn, home and end. These are shared with the scroll keys and require the fn button to activate. The power button looks like a normal key in the top-right corner of the keyboard but this hasn't caused any problems so far. The track pad seems OK, very large and reasonably sensitive. Some reviews I have read claim the track pad surface is glass but it certainly is not. It has a similar look and texture to the laptop keyboard surround but is a separate element. I don't like track pads and normally use a wireless mouse so not much else to say about it. The screen. It's stunning. Compare new and old side by side. The tonal range is brilliant. 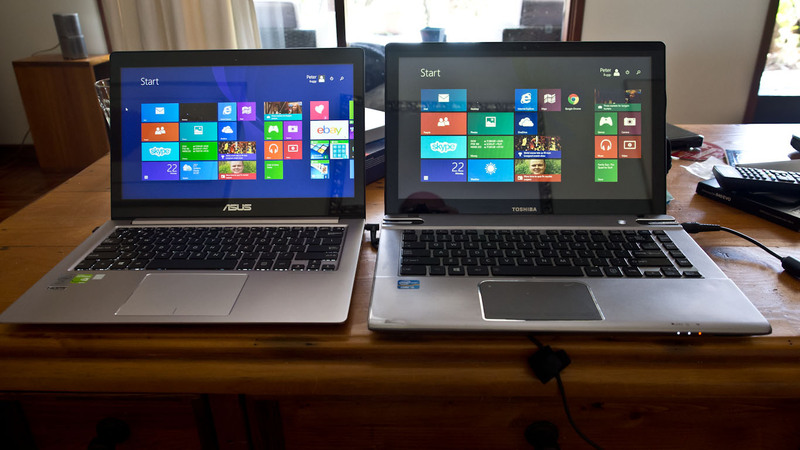 The old Toshiba on the right is totally outclassed. The first job as usual is to calibrate the screen with my Spyder4Pro. Uncalibrated, the screen was 98% of sRGB, after calibration, it was also 98% of sRGB. There was a change after calibration but is was so minor, the screen could have been left as it was. Note, the screen also achieves a stunning 76% of the full AdobeRGB palette. As with any IPS screen, the viewing angles are magnificent. That's better than a MacBook Pro Retina 13!!! While having a touch screen also results in a glossy surface, it isn't quite as glossy as the old Toshiba and the brightness is in another league and it is quite visible when viewed in shade outdoors and you can still manage (just) with full sun. After installing the software, I was rather disappointed with the performance of Photoshop CS5 until I realised the machine did not automatically apply graphics acceleration to CS5. This may have been due to the older version of the software but a quick tweak of the graphics engine to force it to use the dedicated Nvidia Geforce 840M processor soon fixed that. I must admit the processing improvement isn't huge compared to my old i5 processor. That old processor had clock speeds of 1.8 GHz and 2.7 GHz turbo while the new processor 2.0 GHz and 3.1 GHz turbo (but only 2.8 GHz with both cores driven). There is an improvement, but it isn't spectacular. Likewise, the move forward from the Nvidia Geforce GT 630M to the newer Nvidia Geforce 840M is not sensational either. Still, every bit counts. What else - oh, that SSD is brilliant. I would never have a normal hard disk as a main drive. There is no going back. One thing I like about the ASUS is that it is upgradable (after removing something like 13 teeny screws from the base). I can upgrade the memory to 12 gb and the SSD can be swapped out for a larger one and there is even a free mSATA half-sized slot that can take another drive. Half-sided SSDs are currently available to 128 gb but I expect that may grow. Overall, a very nice machine. Very light and compact, well built, some upgrade potential, a stunning screen for photo editing, adequate performance for Photoshop CS5 and other photo editing software and reasonably priced for a light 13.3" laptop.